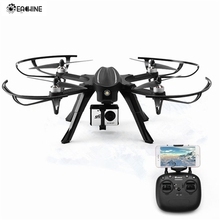 I have mistakenly bought a Eachine EX2H drone without the camera. I did not know that until too late and I could not back out of the purchase. It was an auction bid at eBay and I paid C$90 for it. 1. Is it hard to install a camera, or is it just screw the bracket and plug in to connect? 2. I googled but failed because I don't know how to search for a camera compatible with Eachine EX2H drone. Need a link to the source. Please. Attached is a screenshot of EX2H with the camera hanging from the belly. I am hoping I can do that myself. If I know where and which camera I should buy. ^^ can see the Z02 "AIO" (all in one I guess) that has the camera+VTX in one that's basically the same thing without the nice case. You'd just have to check the voltage range on the VTX if you can power it directly or need some power regulators. Edit ah just saw second post looking for the high quality local recording camera not the FPV one then I guess? That quad is a bugs 3 clone so the C5820 camera should work plug and play or the easier to find C5830 camera will work with some modifications. For the hanging camera those are generally stand alone like a go pro or mobius or runcam (I personally use a "runcam split 2" which does has analog out line to go to VTX for FPV view and separately records to SD card with HD footage). When this went up on Fleabay was there a pic of the drone with the camera but clearly stated that camera was not included or was it misleading? Just asking as you can get one new with camera from BG for not much more than 90 bucks. Not intentional misleading, I suppose. It was stated somewhere down the page. I did not notice that. I forget to mention. I need a 2.4g WiFi camera. Not 5G. Please supply me a link to where I can buy one. In case you are not aware of..... I am in Canada. That bird with camera included goes from C$250 to C$300 and up. I have that banggood link. But I don't know which one to buy. I am not the "photographer" kind of guy. All I need is a 720p or 1080p cam so I can see the images instantly while flying, and maybe take a pic or 2 occasionally. It will be a shameful waste for a guy like me to own a gopro. So,folks……. which one should I buy. It has to be plug-and-play type. I don't want to open up the drone, do the soldering etc. I am waiting for shipping and delivery. P.S. I take it that you do not think much about eBay. That's ok. I got that. I do my online purchasing mainly with Amazon.ca. Once a while eBay. Back to business on hand. I suppose I have jumped the gun. I should wait for the delivery first, then come back for assistance?